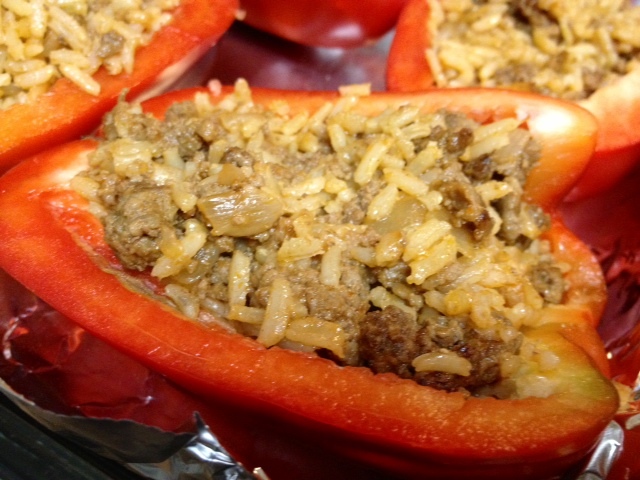 I’ve been wanting to try a stuffed pepper recipe for quite some time, and I’m not sure what’s been holding me back. I think maybe it’s because they sound delicious—I’d never actually had one—and super healthy but look like they take a bit more effort than I’m willing to put into a weeknight meal. So it was with a moderate amount of trepidation that I approached this recipe. 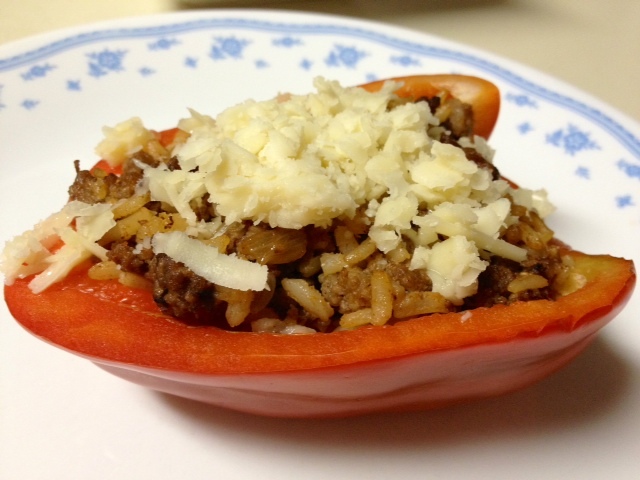 I perused several different ones, but liked the combination of the protein in the beef, the fiber in the brown rice, and the overall simplicity. 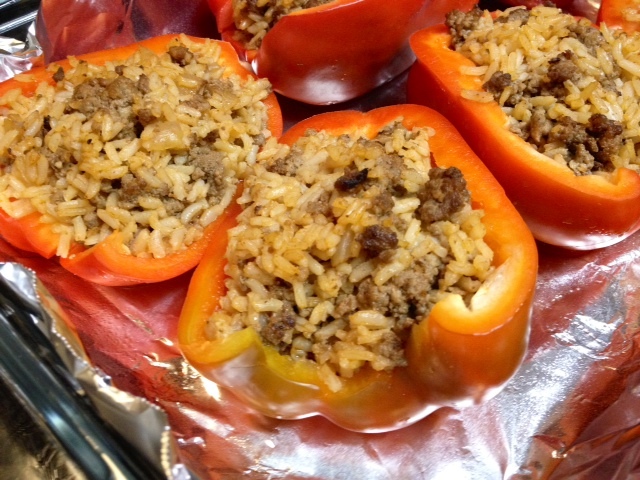 Lots of stuffed pepper recipes I’d seen have lots of different ingredients, which sounds yummy but also over-complicates everything. I was quite happy with this recipe, and will definitely be trying other stuffed pepper recipes (with corn, black beans, etc.). Note, this recipe makes at least 6 half peppers, so if you’re cooking for one person you could bake them two at a time as needed, so you have fresh dinner. Or they make great leftovers, if you’d prefer to just re-heat, maybe take to work for lunch. Start by heating a tablespoon or so of olive oil in a big saute pan (I used cast iron) on medium. Dice your onions and add to the pan, stirring for a couple of minutes until they’re approaching translucent. Oh, and pre-heat the oven to 400 F. And get your brown rice cooking. You can use the stovetop (according to directions on the package). I used my rice cooker. Add the garlic to the onions and saute for another 30 seconds or so. You don’t want to over-cook garlic (or add it at the same time as the onions) because garlic has a much higher sugar content and burns very easily. Hopefully your hamburger is thawed or mostly thawed (that will make this much easier). Mine was a frozen rock so I thawed it at minute intervals in the microwave before adding to the pan. Cook (and chop up) until the meat is completely browned. Add 1/2 cup or so of the broth to the pan. 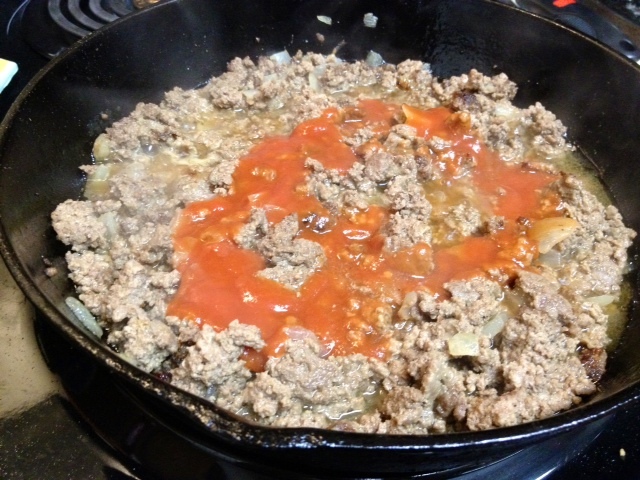 Add 1/4 of tomato sauce as well, and stir everything together. 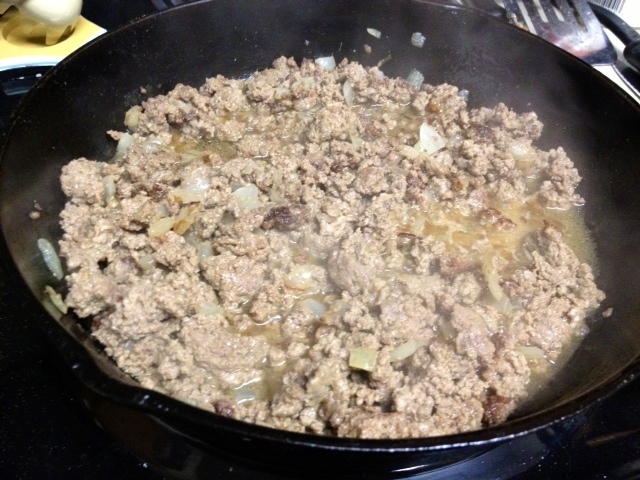 Let simmer for about 5 minutes, so the flavors can get to know each other. Maybe become Facebook friends. It also allows the moisture to soak into the beef (which is important since we’re going to bake it and leach moisture out). If your rice is done (it’s done, right? you didn’t forget it? 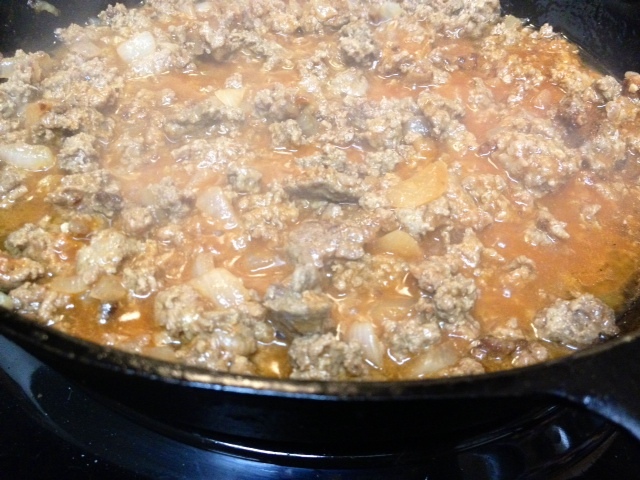 ), add to the beef mixture and stir everything together. Mmmm. 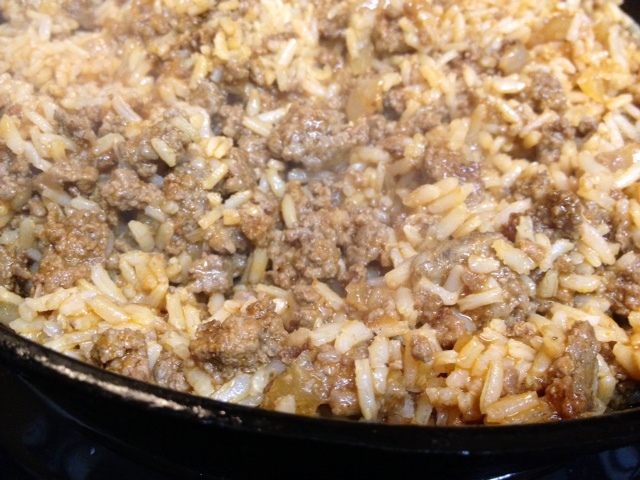 The extra liquid will not only soak into the beef, it will also help plump up that rice. Because we can’t have this be TOO healthy, we’re going to add some cheese. 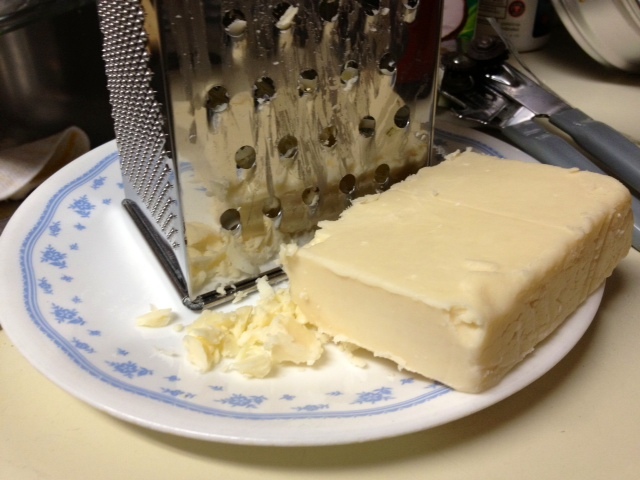 I was making cauliflower and aged cheddar soup, so I had some extra aged English cheddar to sprinkle on top. 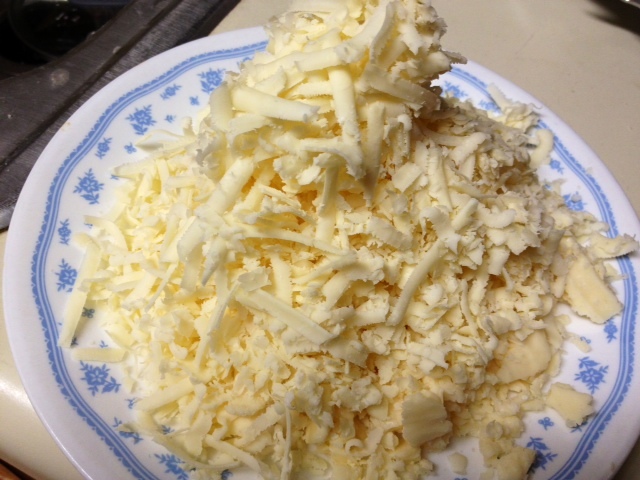 Look at that big, delicious, amazing pile of cheese. Cut your bell peppers in half and clean out the guts and seeds. If I were you (which I’m not, but still) I’d lay down foil in the pan to keep from having a big clean-up. Because I’m super lazy about these things. 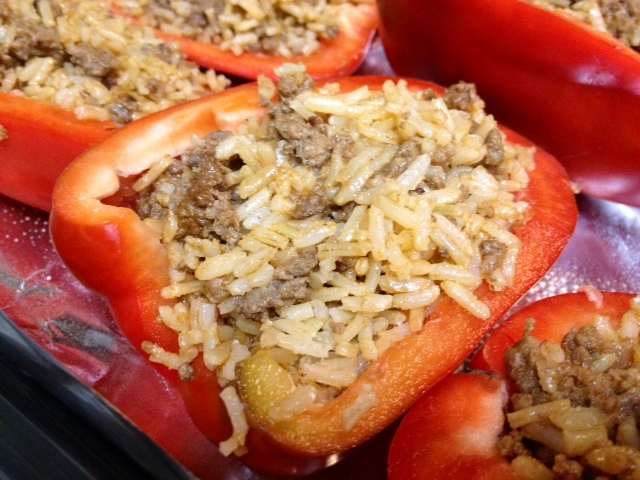 Fill those peppers to the brim with your beef and rice mixture. Before baking, pour a little more of the broth in the bottom of the pan, which helps the peppers cook and not just dry out. Cover the pan with tin foil before baking. Top with a little cheese, and voila! 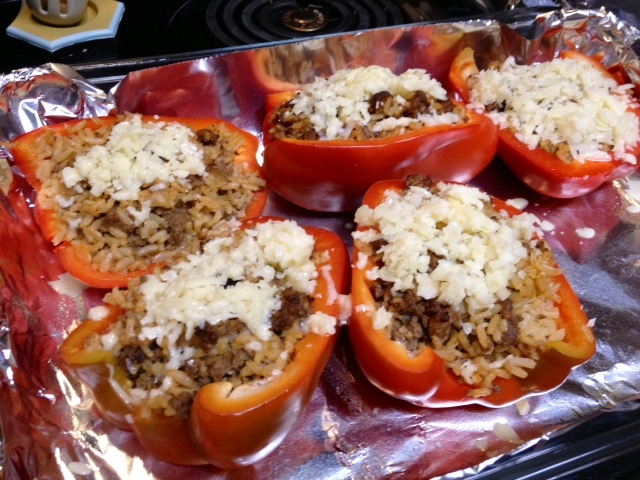 You could pull the peppers out 2-3 minutes before they’re done, sprinkle the cheese on, and put them back in the oven. This would make the cheese melt nicely. Mine didn’t really melt, but it was still delicious. These were great the night-of, but also awesome leftover during the week. I actually didn’t mean to cook them all at once, I was going to save four of them and cook through the week, but ended up not being an issue. It was a great healthy dinner, kept me full for a long time, and awesome for people who are trying to make healthier choices in the new year. Heat oven to 400°. Cook the rice, if necessary; I used a rice cooker, but you can use the stove too. 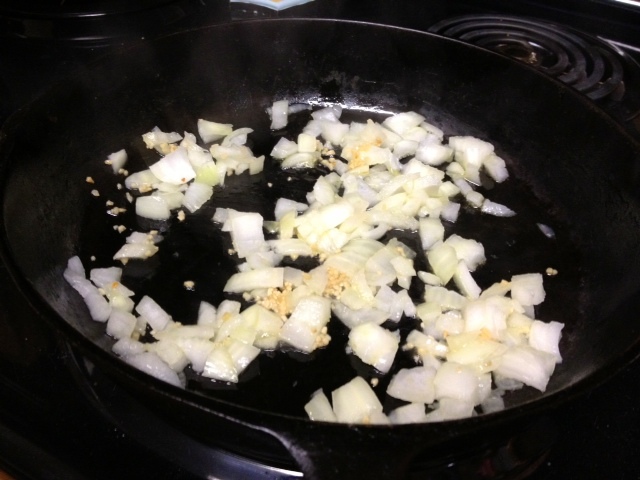 Pour a little olive oil in a medium or large saute pan and heat on medium (5-6 on my stove. 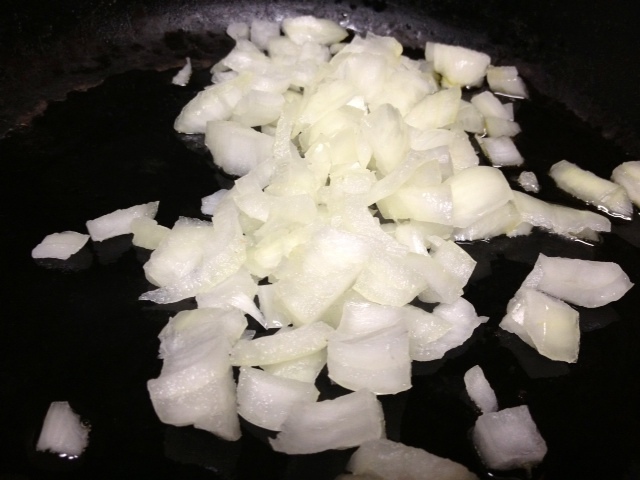 Add onion to the pan and cook for a few minutes, until onion begins to turn translucent. Then add the garlic to the pan and saute another minute or so (don’t burn the garlic!). 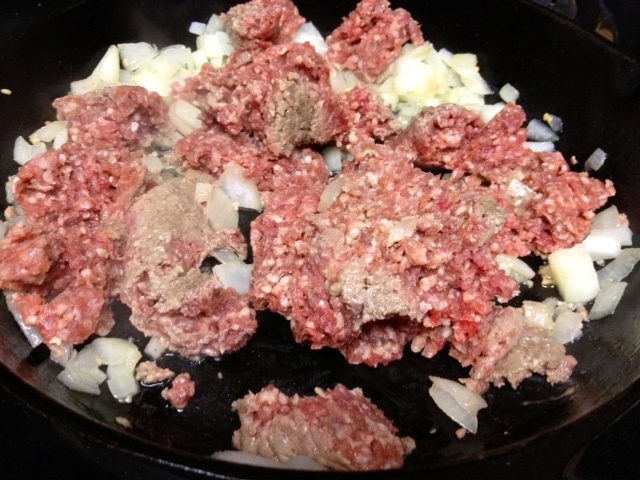 Add the thawed ground beef and cook until the beef is browned. Season with salt, garlic powder, and cumin. Stir in 1/4 cup of tomato sauce and 1/2 cup of chicken broth and simmer on low for about 5 minutes. 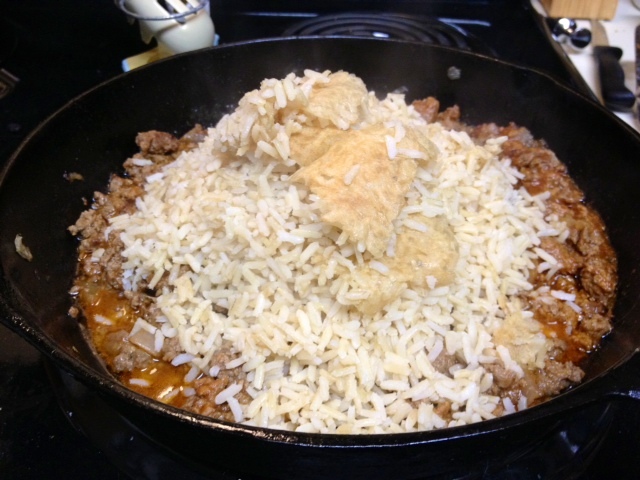 Then add the rice and stir everything together (you can leave the stove on low). 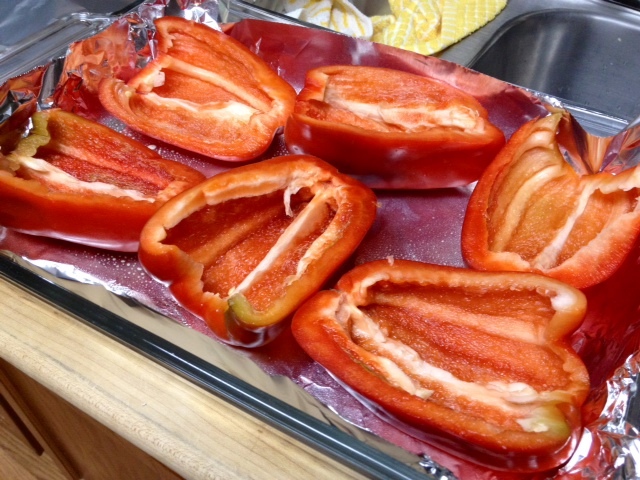 Cut the bell peppers in half lengthwise, and remove all seeds. Place in a baking dishin lined with tin foil. 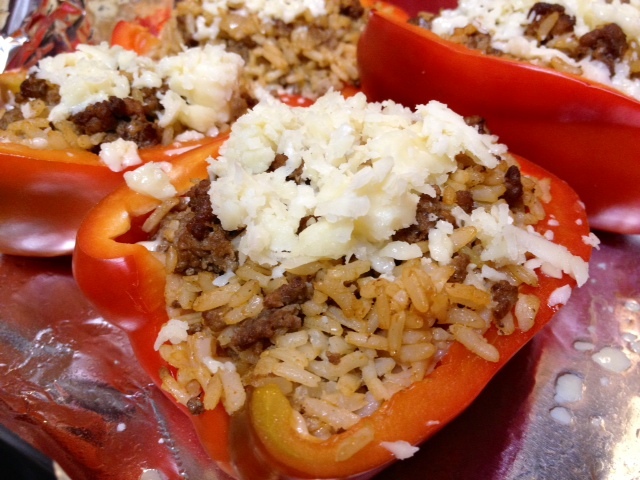 Scoop the meat-rice mixture into each pepper half, filling it as full as you can. 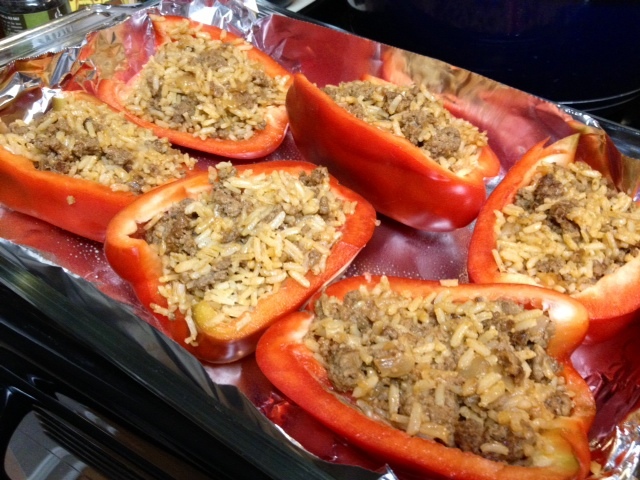 Place all the stuffed pepper halves in the baking dish and pour the remainder of the chicken broth in the bottom of the pan. Cover tight with aluminum foil and bake for about 35-40 minutes. 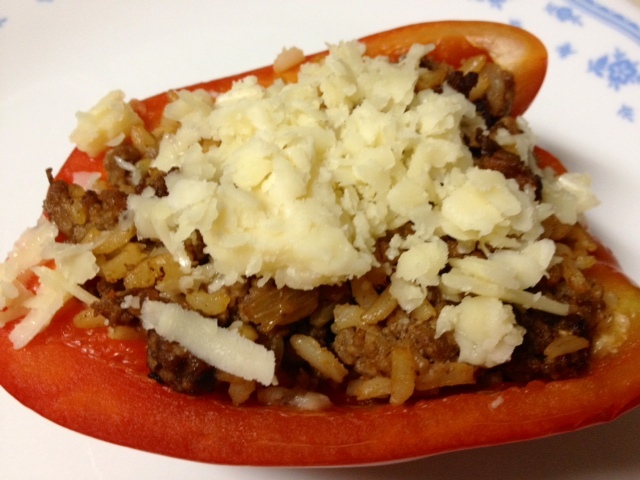 Top with shredded cheese and enjoy.